Corporate bankruptcy generates the externalities that affect also agribusiness and local communities. Economies around the world have undertaken reforms aimed at improving their insolvency systems. The majority of the countries including Poland focused on introducing or strengthening reorganization mechanisms. 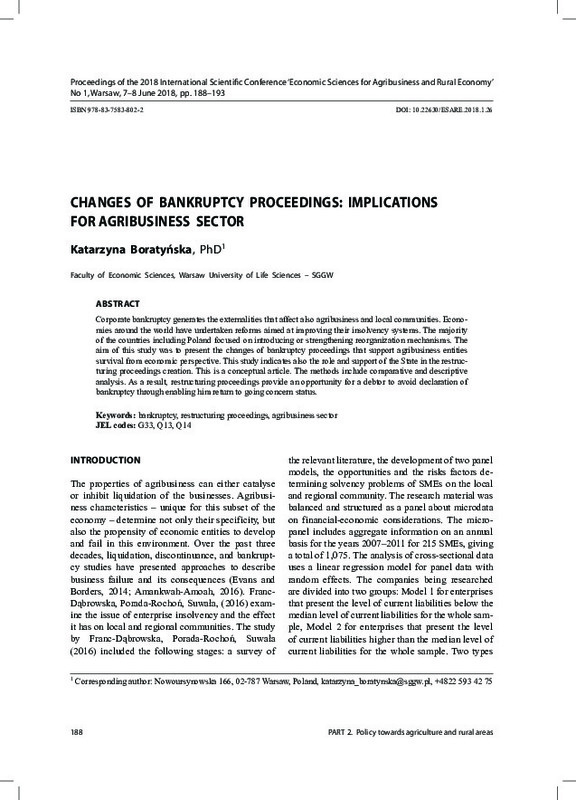 The aim of this study was to present the changes of bankruptcy proceedings that support agribusiness entities survival from economic perspective. This study indicates also the role and support of the State in the restructuring proceedings creation. This is a conceptual article. The methods include comparative and descriptive analysis. As a result, restructuring proceedings provide an opportunity for a debtor to avoid declaration of bankruptcy through enabling him return to going concern status.